Any codgers with a heart condition or prone to high blood pressure over "what is Oldhammer" are advised to avert thine eyes. Avert them! I shall not be vexed by thy judgements. Behold, the Ocrtober of ZeroTwentythree. Back to painting commissions & other stuff for a while. I'm sure I'll probably keep sneaking in a few of my own figures here & there. They look good on 4028mm bases. I like the mushroom detail too. Did you do any post processing on the picture? I also feel that lighter backgrounds tend to make figures appear darker than they are. It's a medium light blue-grey background and has usually worked well with my amateurish lighting. But since I moved a few months ago, my setup has changed and I haven't been able to get it quite right again. In the old attic, I had a low ceiling with a light colored glossy paint that came down to just inches above the back of my desk, and I think I may have been getting a lot of nice bounced, indirect light from that. One of the problems I'm having is findimg a balance between getting enough light vs. washing out the colors. So, for this photo, I tweaked the input levels and saturation a bit. Amazing work. Great colours and conception. 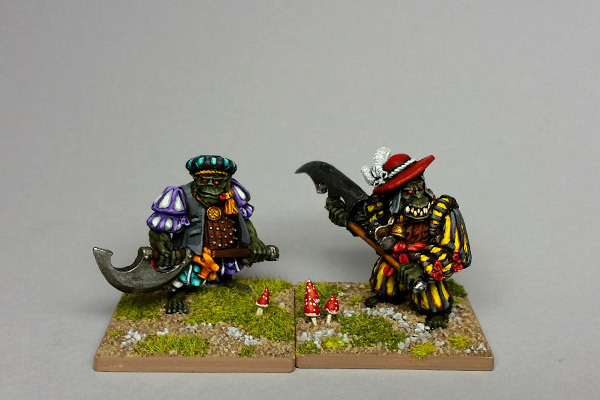 And if anyone were to give you guff about whether deese boyz are Oldhammer, all you have to do is point to the very Kev Adams-esque toadstools. BAM!